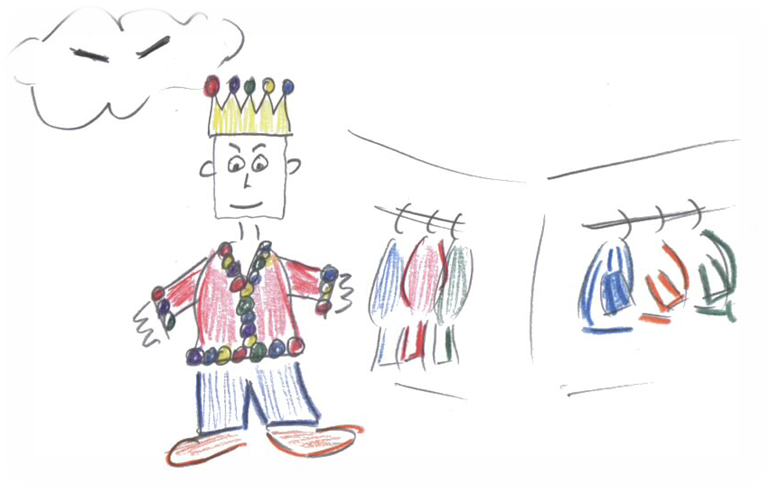 The last monthly meeting of Agile Nantes (presented by Agile Garden) was titled The Emperor’s New Clothes . Behind this name from a tale by Andersen was hiding a workshop on communication in times of stress, from the site www.agilefairytales.com, which contains other agile games based on fairy tales. Here is the definition given by Agile Garden which corresponds to the subject of the workshop: Choose words and actions which we feel, adapted to the situation, and in harmony with others. A congruent person does not wear a mask, they express how they feel, they believe in what they say, they take account of other people and of the circumstances. Most of the time, congruence is our natural behavior in a group, however under stress we often lose that attitude. We lock ourselves in defensive postures, blocking communication, which holds us up in the search for a solution and exacerbate the problem originally causing the stress. This can also have adverse effects on the group which will persist beyond the stressful period. The team is the foundation on which projects are based, it is necessary to preserve it. This is the person who will point fingers (other than themselves) when the project goes wrong. They take account of themselves and the context, but not others. Typical comments will be of the form: ” We are late because John spent days on a simple user-story.” or “None of you know how to properly test, I would have had to do it all by myself. “ In the fairy tale, it is the attitude of the emperor. This is the reverse of the blamer: They designate themselves as guilty, and they are ready to do anything to solve the problem. They take account of others and the environment, but not themselves. Typical comments will be of the form: “It’s my fault if there are so many bugs, I will work all night and on weekends so that we can deliver on time. ” In the fairy tale, it is the attitude of Ministers. A person with this attitude always bring the conversation to the facts. They take into account the context, but neither themselves nor others. Typical comments will be of the form: ” We have to correct 198 anomalies in 3 days.” In the fairy tale, it is the attitude of the people who fear the power of the emperor. This attitude is very common in children but rare in adults. It is to judge someone according to affinities they have with others. A loving/hating ignores the context, to focus on himself/herself and others. Typical comments will be of the form: “It is the fault of John, he is terrible. Everything would have been better if we had kept Alfred as a project manager, he was really good. ” In the fairy tale, it is the attitude of the child who hates the emperor and ignores his power (context). This is the one that will attempt to derail the conversation to another subject, who will joke or will lose interest. They take no account of the context or of themselves nor of others. Typical comments will be of the form: ” What will we eat for lunch? ” or ” I have a call, I will be back. ” In the fairy tale, it is the attitude of the tailor. At the workshop, we separated into 5 groups (one per position), each to prepare a few sentences corresponding to what a person sounds like (as the assigned posture) during a crisis team meeting. The context was a project whose deadline for delivery to the customer is imminent. All stakeholders were aware that the project was heading into a wall without daring to express it, until numerous bugs were reported by testers. We then played predefined postures, and in the end each team had to understand what was being played by the other teams. What was magic in this exercise is that while our sentences were prepared in advance, without any consultation with other teams, the result seemed real, we really had the feeling that a team meeting could have gone so! The result really highlighted the problem with these postures: there is no conversation, each drop his own monologue, and it happens so frequently in real life that it seems natural to us when it is played out, even without joint preparation. Three elements appear when defining the five postures: context, self and others. To be congruent is to always be mindful of those three things. In the fairy tale, the father of the little boy is congruent: he takes into account the situation (that is the Emperor, a powerful man, who is referred), the other (his son in danger) and himself (he loves his son). Another common element of the five postures is the lack of self-esteem they reflect. Contrary to appearances, the blamer lack of confidence in themselves, the attack is a form of defense. A way to believe that they feel blameless, or a technique not to be blamed alone. To be congruent, we have to show confidence in ourselves and others, it is not easy. We can easily fall back into incongruent postures, blaming the client for example. The last exercise of the workshop was to seek our own default posture, the one that we would spontaneously assume under stress. This position may be different in private life and at work. We found that we were also much easier to discover our default position at home rather than at work. This is a very personal theory that came to me after the meeting, but I wonder if it is not because our automatic attitude differs more depending on other rather than the context. Thus, it is very easy to understand how one reacts automatically as a couple, because it’s always with the same person. On the contrary, at work, we might not have to be the same default posture depending on the person in front of us. Hierarchal relationships or personalities can play a role and so there is no single default posture at work .